Thursday morning I stood in the front lawn of a Habitat for Humanity house in Rosedale Court, talking with a local volunteer. My new acquaintance, it turned out, put in 10 years in Army artillery, and while he seems to have adjusted well to civilian life, he told me that the biggest adjustment in coming home was the sheer silence of the night. This is a common tension here, or, I suspect, any community where a large-scale traumatic event has occurred. Some people need to share their stories – and others need not to. Despite the narrative theme of this blog, I deeply respect both responses. The Royal Wedding, of all things, paved over the national story within 24 hours, footage of human suffering replaced by images of pomp and circumstance, but here the victims who need to share their stories have found compassionate audiences. Open meetings were held at local churches where people could do just that. Meanwhile, we stand on the opposite end of the city from where the tornado destroyed his home. This is clear, open land stretching behind the Habitat home to the right, but that’s only due to the razing of wreckage after the tornado flattened 100 out of 188 units of Rosedale Courts, killing six – and when people saw more than dozen blocks of destroyed homes in this neighborhood, everyone was shocked the count wasn’t higher. As a low-income housing development, Rosedale speaks to another story line here – in many areas of the city, affordable old housing likely will be replaced by stronger, newer structures that will be more expensive. Even if the insurance and/or FEMA money comes through, where do folks relocate after a tornado destroys 12 percent of a city? But some stories are positive: My new friends – including their dog who also survived the storm – move into their new Habitat home in a matter of weeks; the dedication has been delayed by their schedules at work (and work, in this economy, is also a good thing). Meanwhile, here in Rosedale, the debris here has been removed, the sun has come out, and as students settle into the groove of their construction tasks – from spackling cracks and touching up the paint job to some earnest ladder-top carpentry and learning to use large power saws – there is good cheer. The energy and optimism of youth is a blessing, particularly when it’s youth guided by conscience. That night, when Marissa Reis asks her fellow students their hopes and fears during the nightly prayer and reflection, it’s clear they know there’s much more to be done – and understand, if, indeed, any of us ever can. 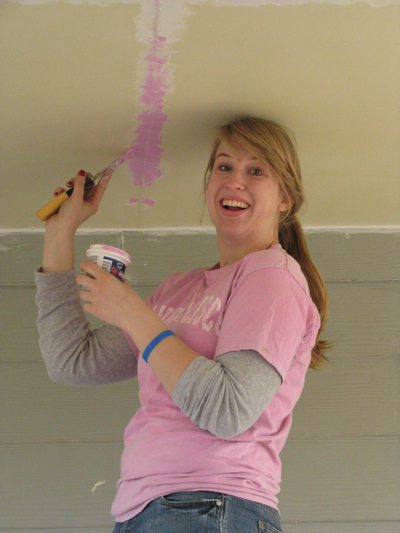 Brittany Wilson braves the scaffolding to spackle the carport ceiling.